The Copper Harbor Light is a lighthouse located in the harbor of Copper Harbor, Michigan USA on the Keweenaw Peninsula of Upper Michigan inside Fort Wilkins Historic State Park. It is a Michigan State Historic Site and listed on the National Register of Historic Places. The Copper Harbor Lighthouse was built on the tip of the eastern point of land that hugs the harbor. The lighthouse aided in the transport of copper from the Upper Peninsula. Ships carrying immigrants, supplies, and equipment increased dramatically. Funding to build the light was approved in 1847. The first tower was constructed in 1848 and resembled that at Old Presque Isle Lighthouse. The Stone Masonry was dismantled, and the stones used as the foundation for the replacement lighthouse built in 1866. The current lightkeeper's dwelling house is a survivor of the first light tower. An improved lighthouse, which also survives, was raised in 1866 three years before the installation of the Copper Harbor Front Range Light and the Copper Harbor Rear Range Light. The steel light tower in current use went into service in 1933. The station was established in 1849. A Fresnel lens was installed in 1856. The current tower was first lit in 1866. It is no longer operational. It was automated in 1919, and deactivated in 1933. The foundation materials are dressed stone and timer, and the building was made of brick. The tower is square. The color is "natural with black lantern." A keeper's house is attached. In 1933, the light itself was removed from the lighthouse, and placed on the adjacent 62-foot (19 m) tall white skeleton tower, which has a focal plane of 90 feet (27 m). It has a range of 14 nautical miles (26 km; 16 mi). On February 22, 1974, the lighthouse was designated a Michigan State Historic Site. On June 7, 2012, it was listed on the National Register of Historic Places. The Copper Harbor Lighthouse is currently (as of 2006) operated as a unit of the Michigan Department of History, Arts, and Libraries. It is open to the public in summer months and features a museum about the lighthouse and Lake Superior maritime history. Other buildings on the location include a detached 1849 dwelling house, which functioned as a storage and oil house. A lighthouse tour is available, complete with a ride on a wooden double-ender launch. The boat leaves from the Municipal pier in Copper Harbor, and takes about 15 minutes to reach the point. ^ a b c Light List, Volume VII, Great Lakes (PDF). Light List. United States Coast Guard. 2012. p. 144. ^ a b "Historic Light Station Information and Photography: Michigan". United States Coast Guard Historian's Office. ^ a b Rowlett, Russ (2013-04-23). 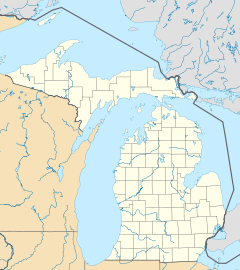 "Lighthouses of the United States: Michigan's Western Lower Peninsula". The Lighthouse Directory. University of North Carolina at Chapel Hill. ^ a b "June 15, 2012 Listings". National Register of Historic Places. National Park Service. Retrieved June 23, 2012. ^ a b Photographs Copper Harbor Light, Lighthouse Central, The Ultimate Guide to Upper Michigan Lighthouses by Jerry Roach (Publisher: Bugs Publishing LLC - 2007). ISBN 978-0-9747977-2-4. ^ Michigan Lighthouse Conservancy, Copper Harbor Lighthouse. ^ Staff. "Copper Harbor Lighthouse". State Historic Preservation Office. Michigan State Housing Development Authority. Archived from the original on December 24, 2012. Retrieved June 22, 2012. ^ National Park Service, Maritime History Project, Inventory of Historic Lights, Copper Harbor Light. Anderson, Kraig, Lighthouse Friends, Copper Harbor Light. Aerial photos, Copper Harbor Light, marinas.com. Copper Harbor Lighthouse, information from Michigan Historical Center, including a virtual tour. Interactive map on Michigan lighthouses. Detroit News. Rowlett, Russ. "Lighthouses of the United States: Michigan's Eastern Upper Peninsula". The Lighthouse Directory. University of North Carolina at Chapel Hill. National Park Service Maritime History, Inventory of Historic Lights, Copper Harbor Light. Photographs, Directions, Waypoints and History from Lighthouse Central. Terry Pepper, Seeing the Light, Copper Harbor Light. Wobser, David, Boatnerd.com Copper Harbor Light. This page was last edited on 23 March 2019, at 22:53 (UTC).